Quick Quack Car Wash presents “Easter Kidapalooza” featuring 30,000 Easter Eggs filled with candy and toys on Sunday, April 21, 2019 from 12 noon to 3:00 pm. Bring the kids to Cathedral City’s Town Square Park in front of City Hall for a FREE event that is all about Kids. You will enjoy DJ music, an Easter Egg Hunt for kids 5 to 12 years of age at 12:30 pm followed by Easter Egg Hunts for Toddlers, pictures with the Easter Bunny and the Quick Quack Duck, bouncy houses for kids, delicious food for a family picnic in the park, Earth Day Art Party for Kids by S.C.R.A.P. Gallery and splash play at the infamous Fountain of Life. Plus, get your free pass to the animated movie “Hop” as early as noon at the adjacent Mary Pickford Theater Box Office for a 3:00 pm showing. Seats are limited. 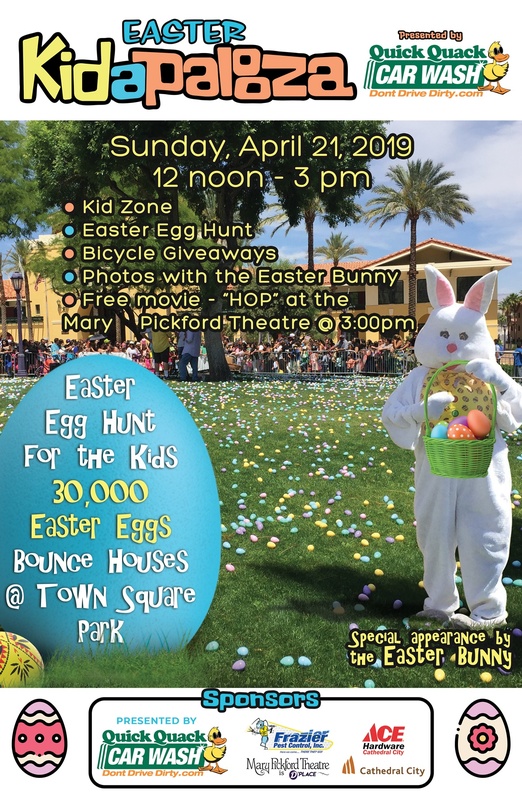 From 12 (noon) to 3:00 pm, kids will enjoy the fun of multiple bouncy houses in the Paseo of City Hall, DJ Music, photos with the Easter Bunny and the Quick Quack Duck, S.C.R.A.P. Gallery’s “Earth Day Art Party for Kids,” family picnic in the park (food and beverages for purchase), and splash play at the Fountain of Life. At 12:30 p.m. – there will be an Easter Egg Hunt with more than 20,000 eggs for kids ages 5 to 12 years old. Don’t be tardy as the eggs go FAST! Thereafter, the little ones between 2 and 5 years of age will hunt for eggs in the toddler section. Bring your own basket for hauling the eggs or get a free reusable shopping bag at the event while supplies last. Four eggs will be randomly given away by the Easter Bunny or the Quick Quack Duck that has a special message inside that wins a child bicycle. 3:00 pm – the Mary Pickford Theatre will show a free screening of the animated movie, HOP. Passes will be available at the Mary Pickford Theatre Box Office as early as noon on April 21st for the 3:00 pm showing. Seats and the number of passes are limited, so get them early! Please thank our sponsors who help make this event possible including Quick Quack Car Wash, Frazier Pest Control, Ace Hardware Cathedral City, Mary Pickford Theatre is D’Place, and the City of Cathedral City.